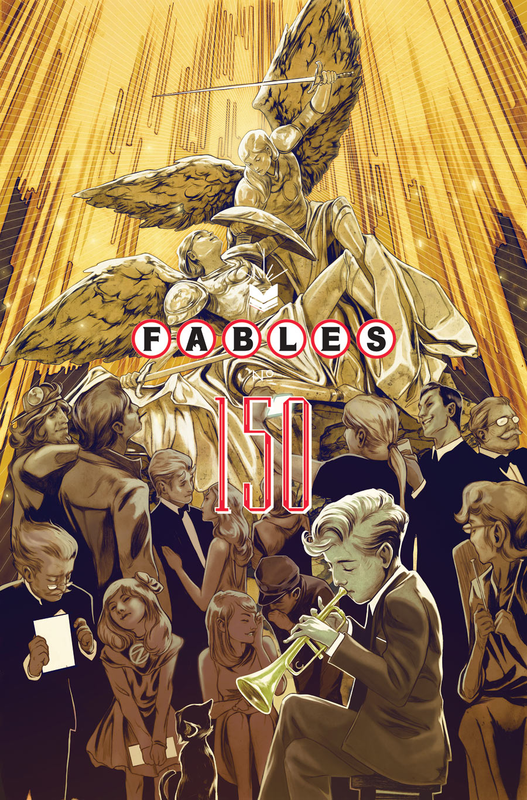 #150 marks the last issue of Fables. 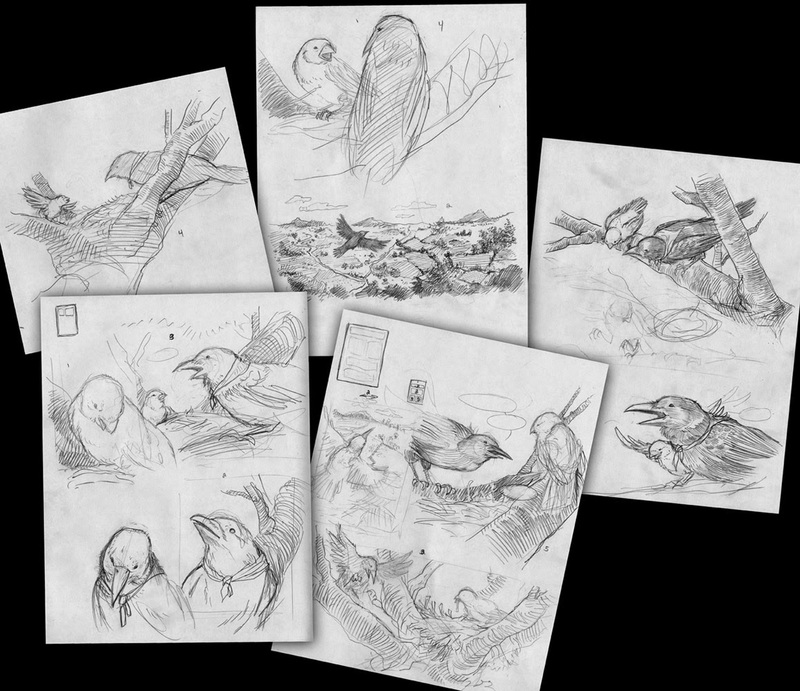 Bill Willingham, who'd contributed a Legends of the Guard story for Volume 2, and had previously asked me to contribute to House of Mystery, asked me to do a 2 page story about the raven Clara. This last "issue" of Fables, which has been out for a bit now, features a great many talented contributors and comes in at 160 pages and is more like a trade paperback than any "issue" you've ever seen. 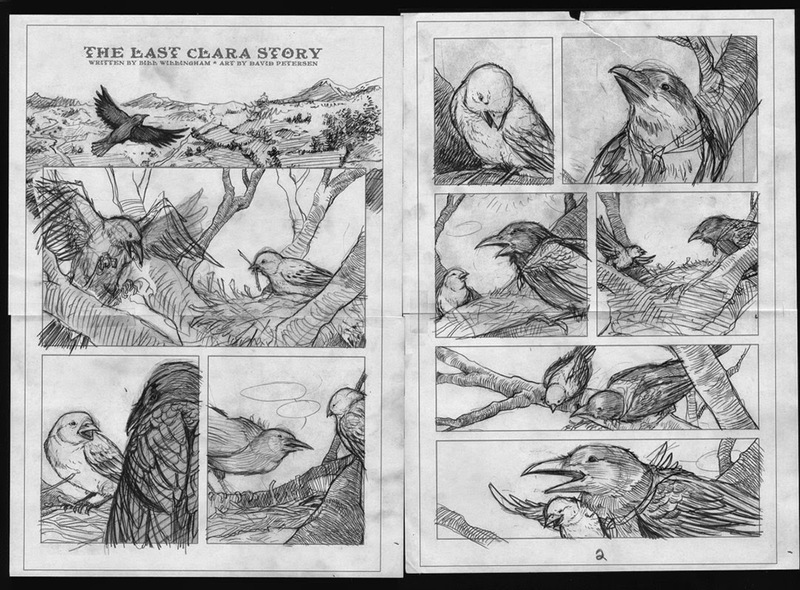 For today's blogpost I'll be going over my pages for "The Last Clara Story" and the process for getting them done. Bill's script was broke the first page into four panels where Clara flies over distant lands and then descends into the crook of a tree to visit with a certain bluebird. The rest of that page and the six panels of page 2 are their conversation (note: I'm being a bit vague here to not spoil the story details). 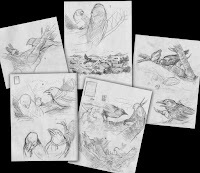 Then I scanned in the pencil sketches and laid them out as pages in Photoshop. Here I was able re-size my sketches and play with panel sizes until everything fit as a page that could still flow for readability. This is also a moment when I can make changes to drawings by enlarging or shrinking elements if I've drawn them out of proportion. The digital composite is then printed out at full size on sheets of copy paper (and taped back together seen here). The next step is to ink the pages. I tape the printout to the back of sheets of bristol board. The bristol is the surface I'll ink on. 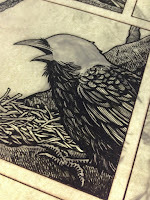 Using a lightbox, I can see through the bristol down to the printout. I use the printout like other artists use pencils, but with my way, I didn't have to draw everything on the page and I don't have to erase the pencils when I'm done. 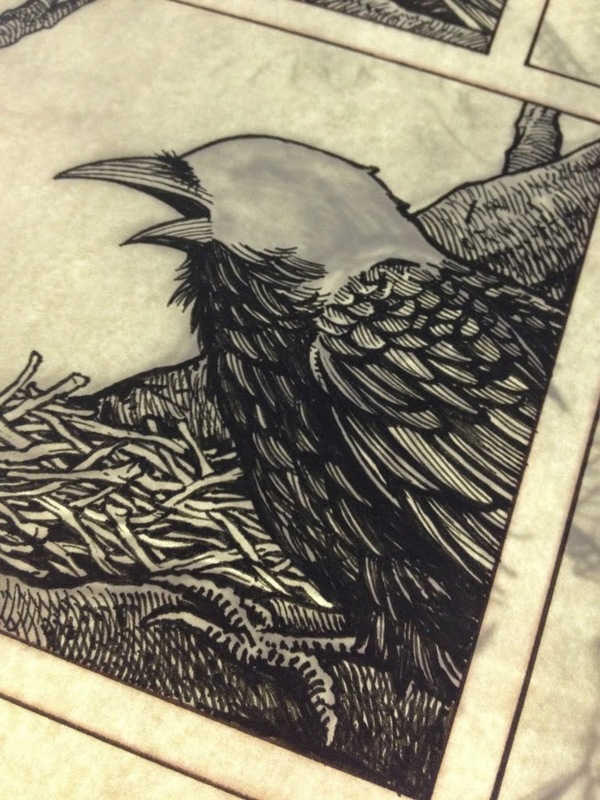 To the right you can see a panel in progress of being inked. I use Copic Multiliners for the linework. 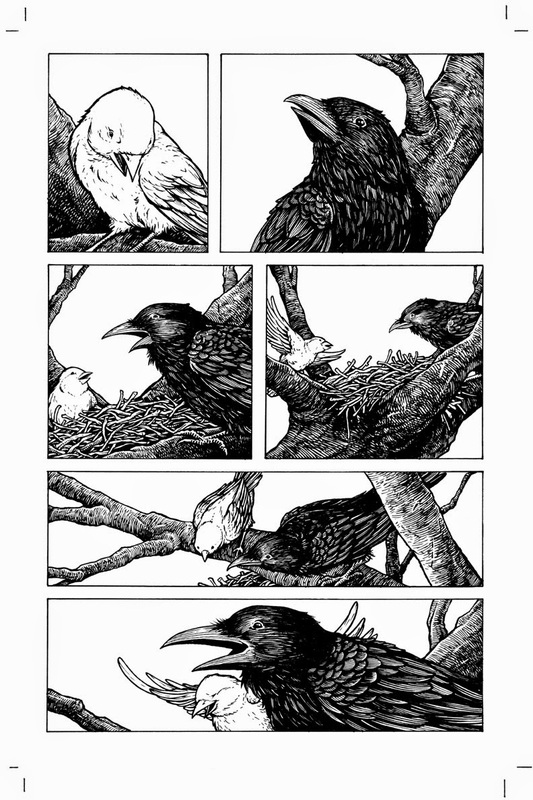 Below you can see both pages fully inked. 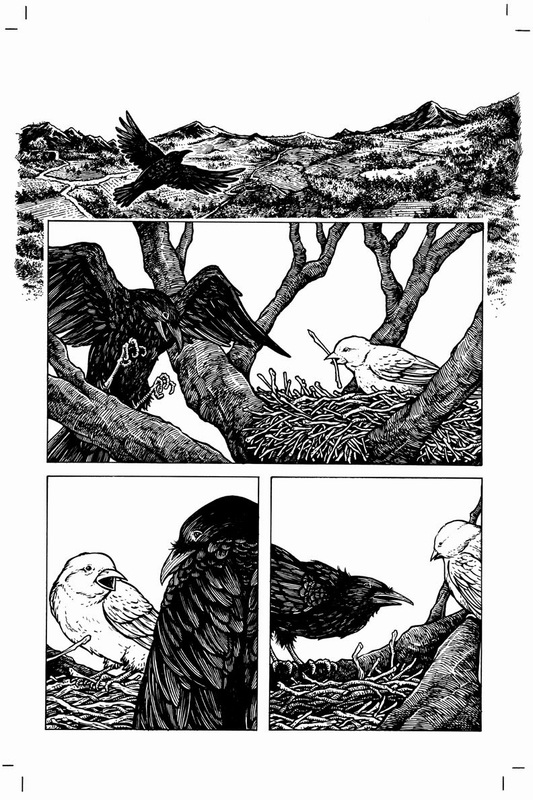 This story marks the first time I've not colored my own work for publication. 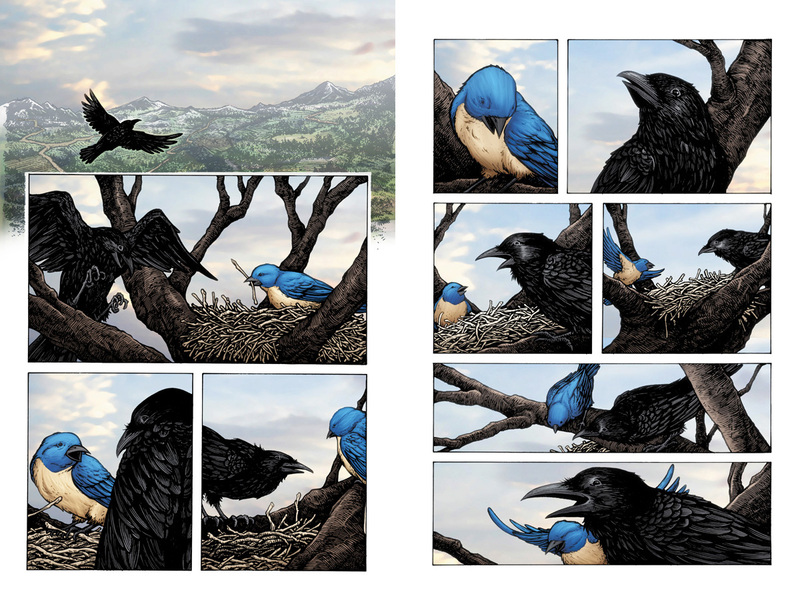 Andrew Dalhouse colored this story for the book and I think he did a great job. Especially with that opening shot of Clara flying high over the landscape. So farewell to Fables. 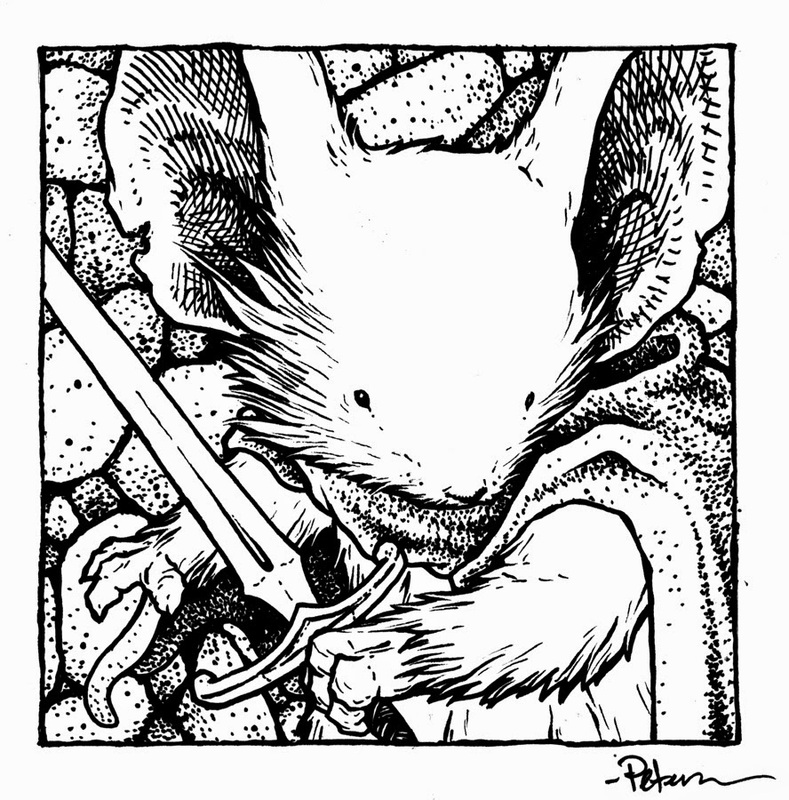 I look forward to what Bill Willingham and Mark Buckingham have in store for their fans next. For her first trip to the San Diego Comic Con this year, my niece Kate said that she wanted to cosplay. Because I'm exhibiting and wouldn't be able to go back and forth with her to the hotel, I suggested that she pick something that was as comfortable to wear as her everyday clothes, no heavy props, no elaborate makeup, no thick bulky costumes. 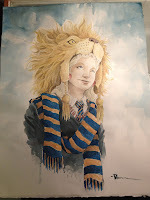 She said she wanted to go as Luna Lovegood from the Harry Potter books...but Luna when she was wearing her lion hat and supporting Gryffindor. 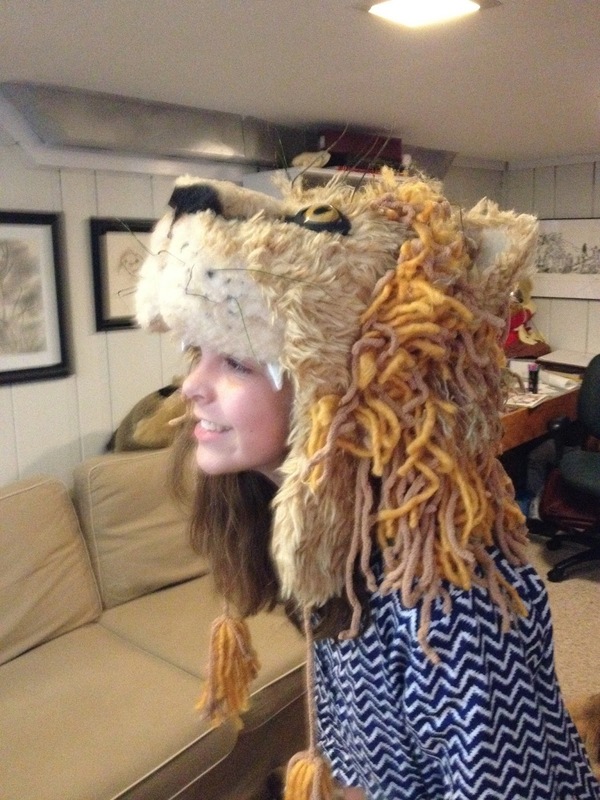 The only hitch was, she and her mom could source everything she needed..except the lion hat. So she asked me to help. 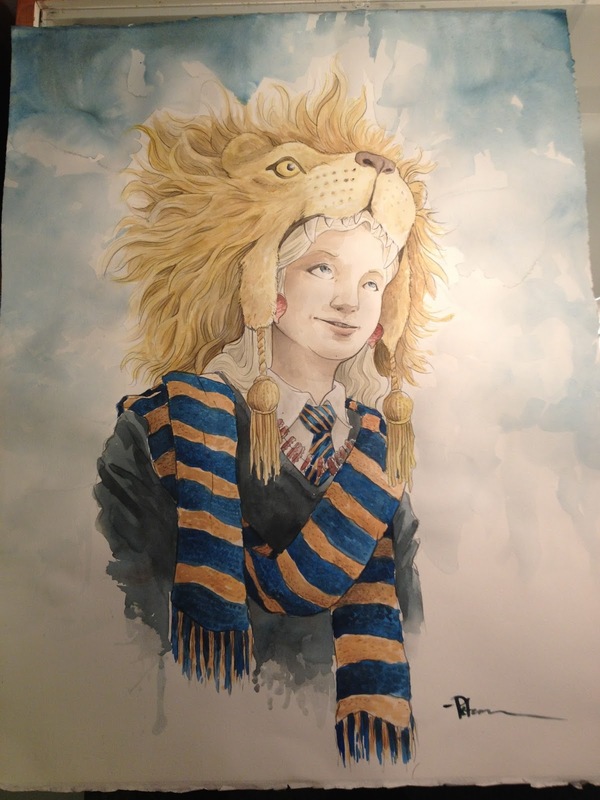 We looked at the version of the hat from the movie, but I'd done a painting of Luna in that hat where I thought my design would work better. 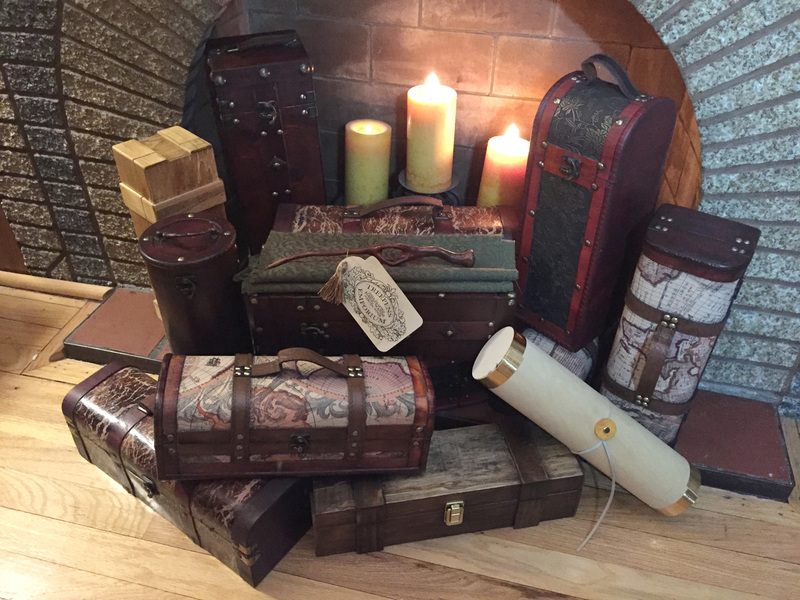 The materials were ones that I could obtain and they would also pack well and not end up damaged inside of luggage. The tassels & ear flaps were also something I'd included in the painting that I hoped I could pull off for Kate's hat. For materials, Kate and I made a run to a fabric store to get some craft furs, something for the mane, and other misc. 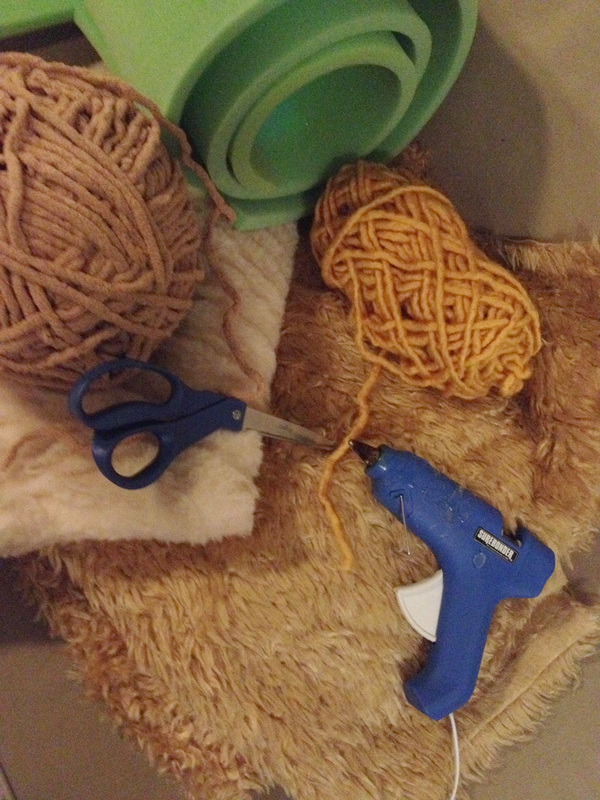 The green roll is upholstery foam that I used to make the understructure form of the lion's head. 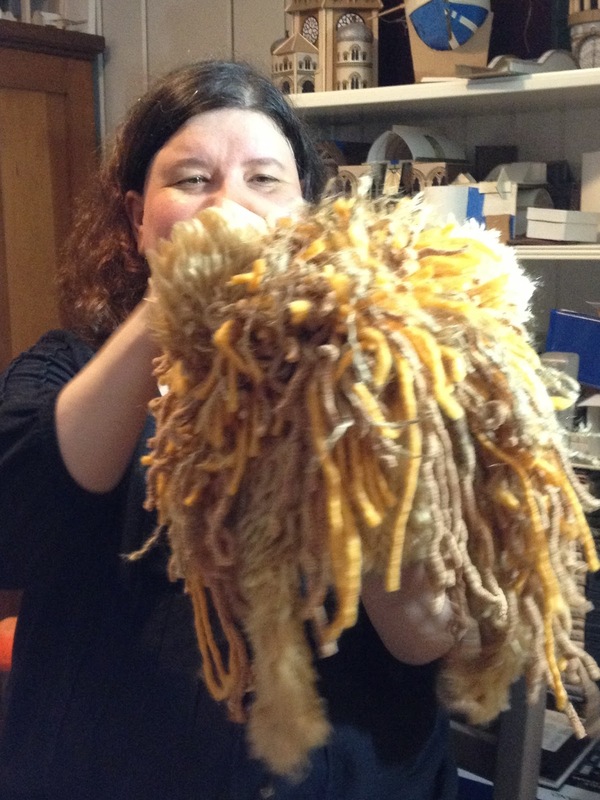 For the mane, I'd planned to do it all with feathers, but a combination of knowing how MANY packets of ostritch feathers from the craft store and the fact that the colors were too stock YELLOW or ORANGE for our more natural fur color meant we went for something different: yarns. I didn't use any thread to sew the hat or any component of it...everything was done with the crafter's best weapon: Hot Melt Glue! Unfortunately, I didn't get process photos of the head when I was working the foam shapes or starting to cover the head with the different furs. 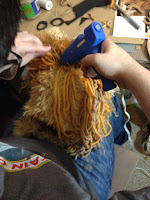 This is the earliest photo I have of the process when I got the golden fur attached to one side of the hat & flap and glued on an ear. To get the fur to conform to the foam's contour, I just draped the fur over top and then would start making cuts where the fur puckered and wouldn't lay flat. A little drop of HMG to tack it down and then work on to the next area. Originally the eyes were going to be these made of yellow and black craft-foam sheets. I used copic markers to add some tone and details to the iris, but ultimately, Julia suggested I use some taxidermy eyes I had stored away (for the same puppetry project I had the fur on-hand for) and we didn't use the flat eyes. The longest part of the whole process was the mane. I'd take a length of yarn, tie a knot in the middle and glue the knot to the hat so that each glueing resulted in two strands of mane-hair. 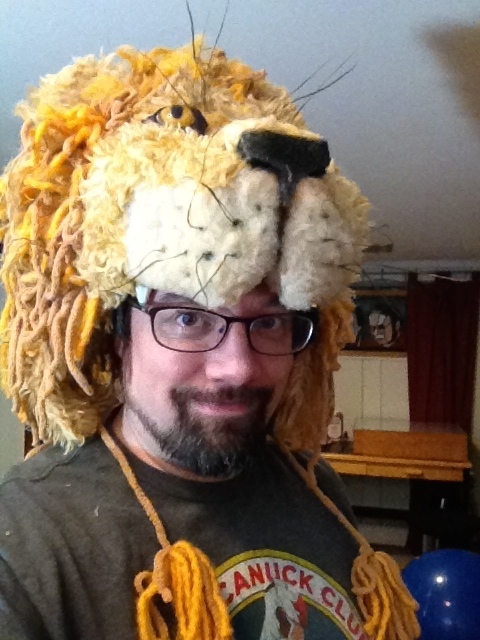 I glued and knotted and trimmed, and cut, and knotted, and glued for many hours before there was enough mane to look like a bulk of lion hair instead of a sad craft project. Kate helped me on and off, but most of the glueing and cutting was a one man opperation, so she worked on a coloring project of her own. Julia sat and pre-cut lengths of yarn at different lengths and knotted them for me, and as always offered her opinion and suggestions for how to improve the hat. She noticed I would get clumps of the same color, and helped point out where I needed to blend in the two colors of yarn and the natural twine in so the mane looked more natural and even. 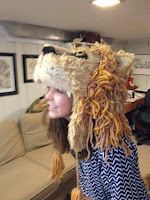 Here are a few last shots of the Lion hat from that night after it was finished, including one of Kate wearing it and one of me wearing it. 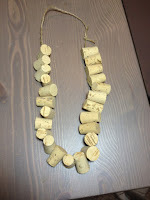 Oh, and I also strung up some unused wine corks so Kate's Luna could wear her Butterbeer-cork necklace around SDCC. Last Christmas, I tried my hand at wandmaking. 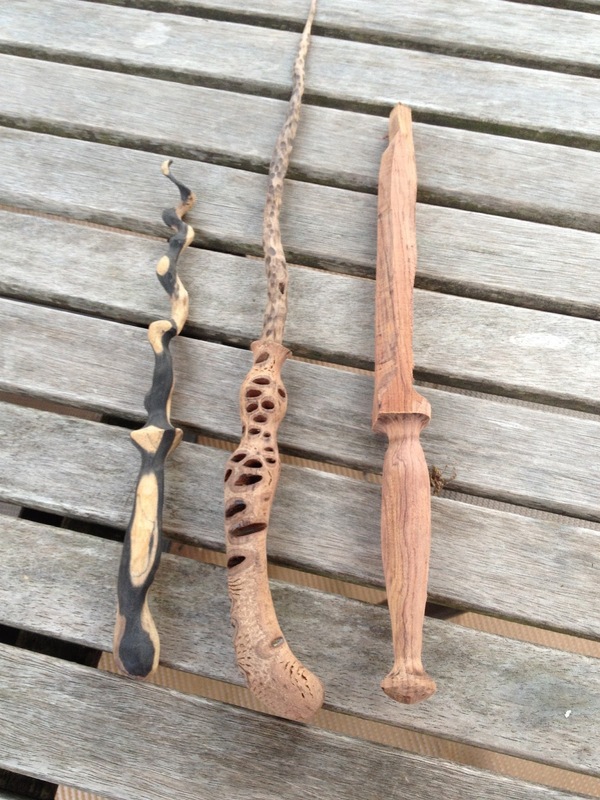 I like woodworking and chances to work with my hands, so as gifts for my three nieces, I set out to make some wands. However, I wanted to put my own artistic voice in them, so instead of trying to pass these off as some other wand-maker, I opted to scramble the letters in "David Petersen" to become "Vidad Treepens". To the left is a logo I created for the tags. I went to my local woodworking supply and found 1" x 1" x 14" stock (I assume for turning wooden pen holders on a lathe) in exotic woods. Grabbing a handful, I made a wand for each niece. 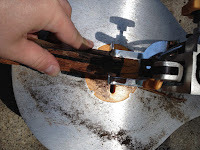 Some of the work was done on a jigsaw, some was done with a knife, but most was done with a Dremmel. 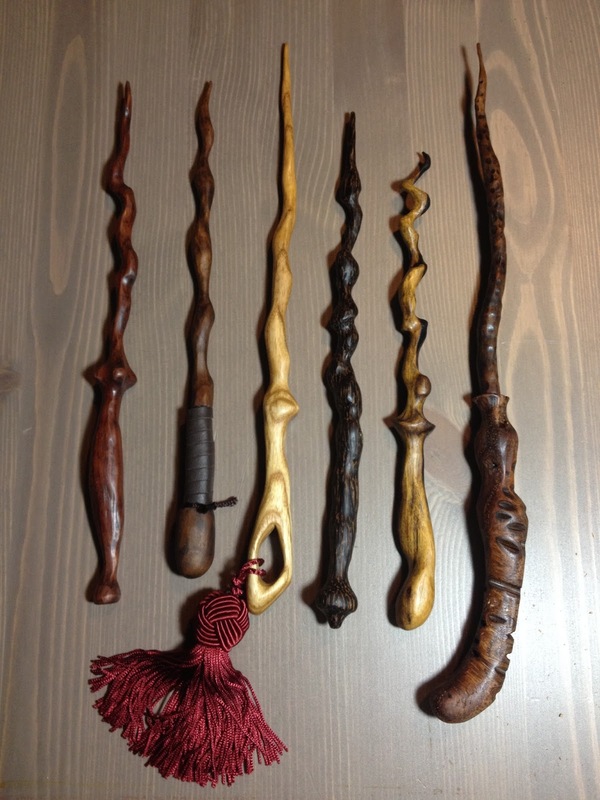 The styles of the wands were a combination of the wood kinda telling me what shape it wanted to become, and something to echo the personality of the niece who would own it. 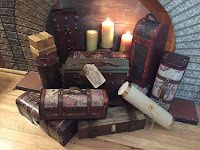 To dress up the gifts, I bought thin wooden boxes with sliding lids, packed them with magical looking fabric, and tea stained some tags affixed with tassels to each wand. The labels were then filled out with the wood species, length and other info. Julia's handwriting is beautiful, so I had her write on the tags. The nieces were all very happy with their gifts, and I was happy to have made them. Cut to June of this year. One of my best friends, Jeremy Bastian, was having a birthday, and instead of drawing him something, I decided he too needed a wand. 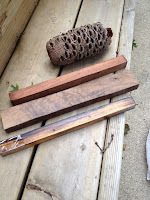 Back at the same woodworking supply shop, I picked up some more of those 1" x 1" x 14" hardwoods (Black & White Ebony and Cocobolo this time) along with a scrap of Black Walnut and a Banksia pod. I'd seen the pods turned on a lathe to make little flower vases, but figured it might make a really cool wand grip. Because it was June and not cold like when I made my niece's wands, I could comfortably work outside and use more tools. 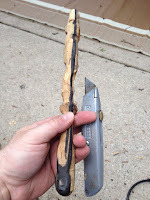 I used a jigsaw to cut down the rough shape of the wand to get the taper and establish where the grip ended and the wand-shaft began. I also used an old bench grinder my grandfather made out of a broken washing machine's motor. The grinding wheel on it is in need of replacing anyhow, so I didn't mind mis-using the tool to do some more of the rough shaping. Besides Jeremy, I'd also decided that I wanted to gift two people from Archaia/BOOM! 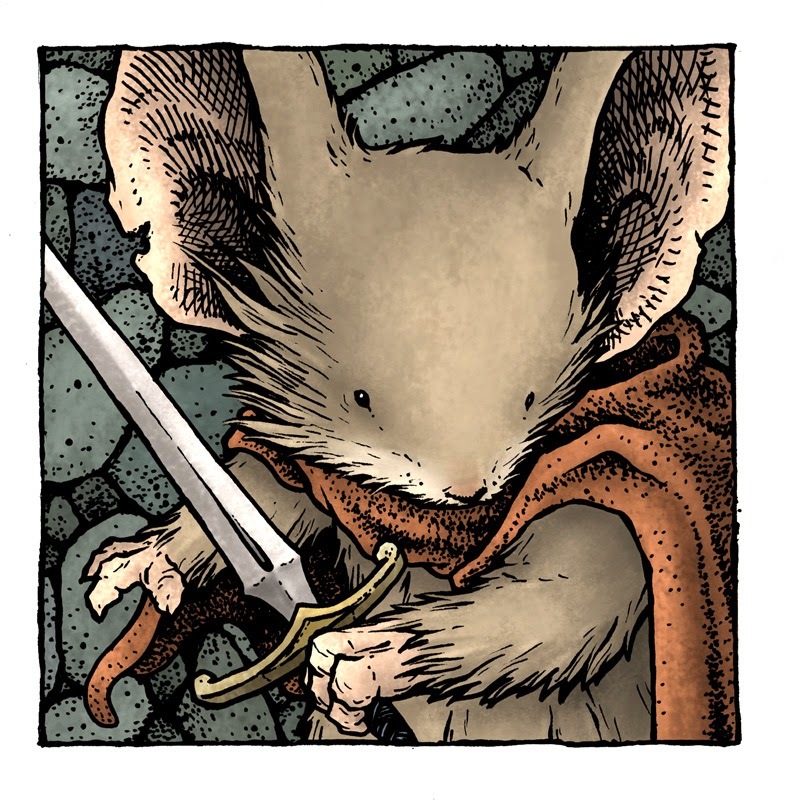 with wands: My editor Cameron Chittock for his awesome hard work on the Art Of Mouse Guard Book, and Irene Braddish for helping Julia and I with hotel and badges for our nieces who we took with us this year. 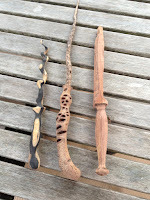 Jeremy's wand (center) I'd always intended to be the Banksia pod with a Walnut shaft. The Black & White ebony was speaking to me as Irene's...so I started crafting the Cocobolo for Cam....but the wand that was emerging from that piece of wood just didn't feel like Cam to me. So I went through my other wood stock options. I had more walnut, a piece of Black Palm I didn't use back when I made the nieces' wands, and some oak. I think I had wand fever by this point. But I thought "As long as I'm already making the mess, why not use up the stock". As I started with a rough shape in the oak on the jigsaw, it was obvious that wand was to be Cameron's. Here are the rough starts to the new Oak, Walnut, & Palm wands along with a more refined Cocobolo and Jeremy & Irene's wands. 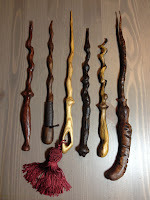 To counteract the tackiness, I buffed out each wand on a buffing wheel to get them feeling "like glass" Julia says. It's a long process that heats up the finish and hardens it as I go. A few of the wands needed to be tricked out even more after the buffing. 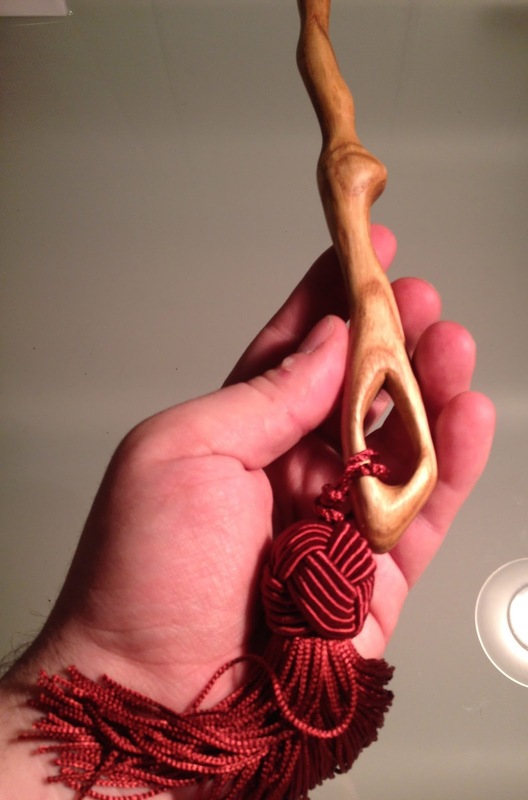 The oak wand for Cam (middle) got a cool turkish style tassel added to the grip's opening, and the Walnut wand to the left of it got a leather wound grip. 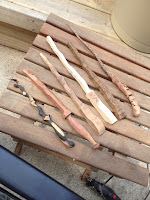 "Vidad Treepens" had set out to make 1 wand and ended with 6 new wands. Jeremy's: Banksia & Walnut, 14-3/4"
Irene's: Black & White Ebony, 10-1/2"
You can see a lineup of many of these to the left, and below are individual detail photos of all the wands. Black & White Ebony Wand 10-1/2"
It was fun to get back to some woodworking, make some gifts for people, and get away from the drawing board. 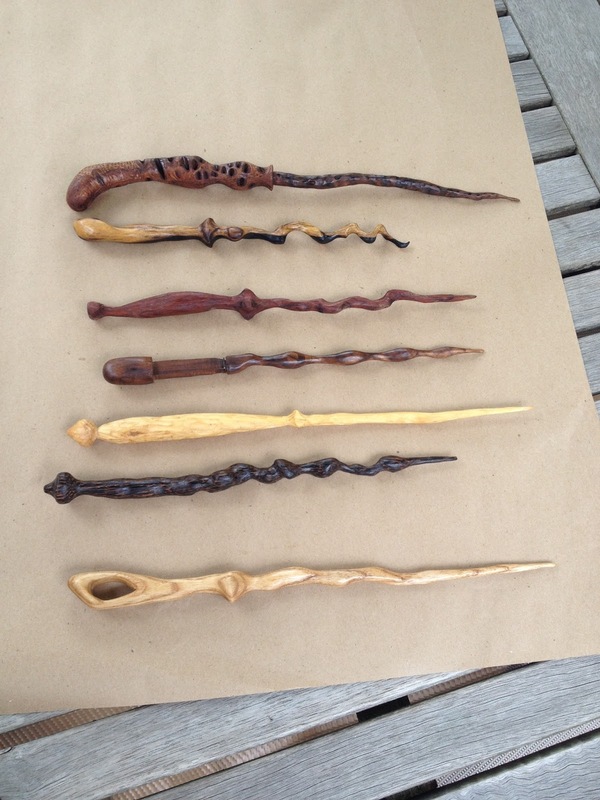 But I didn't realize how time consuming it was to do the wands the way I wanted to. 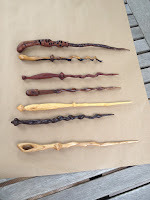 At most, I could get 2 wands fully carved in a day (though one day I did get 3 done...but it was a long day) And that didn't factor in all of the staining, and finishing (and their drying times.) I don't know when or if I'll be afforded the time to make any more of these. So consider Vidad Treepens retired for the time being.